Amy Spungen is a freelance editor and writer, and a huge fan of the Chicago Botanic Garden. Plants of Concern volunteers come from many backgrounds, but all share a common denominator: not surprisingly, they are concerned about plants. 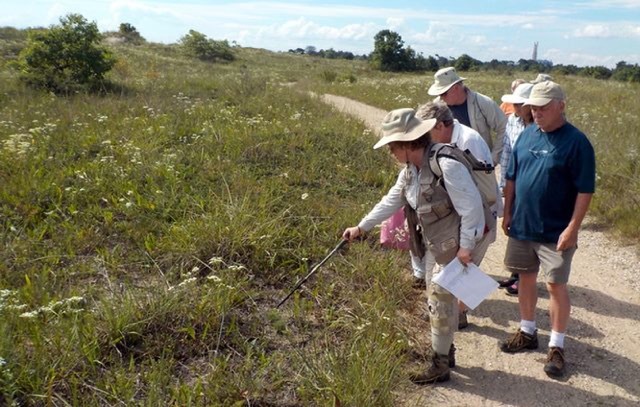 So concerned are these citizen scientists, in fact, that they are willing to traipse all over our region of northeast Illinois and northwest Indiana to monitor hundreds of rare, threatened, and endangered species in a variety of habitats. Their findings help plant scientists understand and work to mitigate the effects of climate change, as well as encroaching urbanization and invasive species. Here are profiles of three Plants of Concern volunteers, in their own words. We hope these stories inspire you to consider joining their ranks. Another Plants of Concern volunteer recently blogged about her experience as a newbie with relatively little plant-related expertise, and you can find that post here. Bachelor’s degree from DePaul University in visual arts; master’s degree in religious education from Loyola University. Worked for many years as a director of religious education in the Episcopal church, in the commercial art field for more than a decade, and now as administrator and a lead teacher in a nature-based preschool. Earned a botanical art certificate from the Morton Arboretum. Helped develop the Field Museum’s Common Plant Families of the of the Chicago Region field guide. I started volunteering with Plants of Concern in 2002. I learned about POC after a chance meeting at the REI store in Oakbrook with Audubon representative and Northeastern Illinois University professor Steve Frankel. Steve told me about POC, and that meeting changed my life in a huge way. I monitor 25 species at nine different sites, including Grainger Woods in Lake County; Theodore Stone in Cook County; several high-quality prairies in Cook, DuPage, and McHenry Counties; and Illinois Beach State Park in Zion. POC assigned them to me because of my interest in and ability to ID many species of native orchids (there are more than 40 just in the Chicago region). But I monitor other plants besides orchids. Volunteering for POC differs from most other volunteering positions I’ve held [at the Art Institute and the Field Museum] because there is a lot of independence, and also much more technical training. This citizen science is vital to the sites’ ecologists—most agencies don’t have enough funding to pay staff to collect the valuable, detailed information we do. Volunteers also are highly accountable, and you need to be really sure about your species. That knowledge comes over years of participation, but even if someone just participates once, and goes out with a more experienced monitor, the information collected helps fill gaps in our understanding of our natural areas. And it’s way more fun than playing Pokémon, once you get the hang of it! My advice for prospective volunteers is to go out first with more experienced monitors. Learn from them—they are better than a digital (or even paper) field guide. Clean your boots off carefully beforehand; don’t track any weed seeds into a high-quality remnant. Observe more than just the monitored plants—look for butterflies, listen for birds, notice the dragonflies and frog calls. Tread lightly and watch your step. Bring extra water and a snack. Use bug spray. Learn what poison ivy is but don’t be afraid of it—just don’t get it on your skin! No matter how hot it is, I wear long trousers, long sleeves, a broad-brimmed hat, and thin leather gloves. Never, ever, go out in the woods alone. Let people know where you are going and when you plan to return. Watch the weather signs. Keep your cell phone charged and with you at all times. Above all, enjoy this one-of-a-kind experience! Bachelor’s degree in agriculture technology/animal sciences from Utah State University; master’s degree in food science from the University of Tennessee, Knoxville. Trained as a food-science researcher focusing on meat quality. Researched pork quality for a commercial pig farm/processing plant and a pig genetic company. I have been volunteering with Plants of Concern since 2012. I am interested in nature and enjoying the outdoors, and this is a fantastic program for me. My family always spent time hiking and fishing on weekends. I grew up in Taipei, Taiwan, where we had easy access to mountains and the ocean—unlike in the Midwest. We also had a container garden on top of our four-story building, and I helped to take care of the plants. For POC I primarily volunteer at Openlands, which is about 20 minutes from my house. However, I have also volunteered farther away, south to Will County, east to the city of Chicago, and north to Zion. Plants of Concern involves many aspects of science: identifying target plants and knowing the plants surrounding them, locating target populations, and using statistical methods to measure populations. For me, the most fun thing is learning new things each time I come out to the field. Maybe it’s a new plant that I have never seen before, or a new hiking route. The most frustrating times are when it’s hard to find the target plant because the population is low. The advice I have for prospective volunteers is to keep your curiosity alive! Bachelor’s degree in botany from the University of Illinois Urbana-Champaign; master’s degree in botany from the University of Minnesota. Has taught botany at Harper College since 1987. I have been interested in plants since I can remember. My father loved to hike, and my mother was a gardener. Instead of moving furniture around, my mother moved plants. We spent a lot of time outside. I have volunteered with Plants of Concern since its beginning. 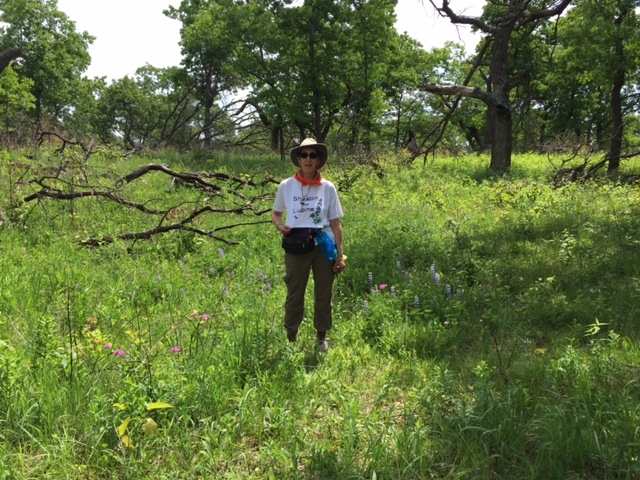 I monitored white-fringed prairie orchids with the National Fish and Wildlife Foundation and many other plants with the Nature Conservancy even before then. I knew people (still do) at the Chicago Botanic Garden, and I heard about the program from them, so it was sort of a transfer. I remember that when POC started, we worked in forest preserves. I understood why there was a desire to work in protected lands, but I said we needed to include other properties. And the program expanded beyond the preserves! I actively monitor for POC at Illinois Beach State Park (IBSP) and also help out at Openlands when I have time. The forays are great fun. That’s my favorite thing: getting out there and being with other people and learning about new plants. At IBSP, visitors are expected to stay on the trail. Of course, most plants don’t grow right on it, but you can usually spot them. Once I was looking around for plants and saw this guy sort of thrashing around in the cattails. I reported him since he looked so bizarre out there, and it turns out he was a skipper [butterfly] expert taking samples for the Karner blue butterfly project. I met him later…a really nice guy, it turns out! What makes Plants of Concern special is that it is so well run. The staff is quick on feedback and offers lots of help. The training programs are excellent. I’ve heard some terrific speakers, too. Other organizations sometimes don’t seem to have quite the staff or funding for their programs, which can make volunteering challenging. If I had to identify the biggest challenge as a POC volunteer, it would be the paperwork. With POC you can do the entry online, which helps. But filling out forms remains my least favorite thing to do…I just filled out a form [in August] for data collecting I did in May. My advice to new Plants of Concern volunteers is to go to the workshops—even if you think you know the stuff. It’s amazing what you can learn. And when you first go out, it can be hard just to find the plants, even using a GPS, much less to know what to do when you find them. So go with experienced people! 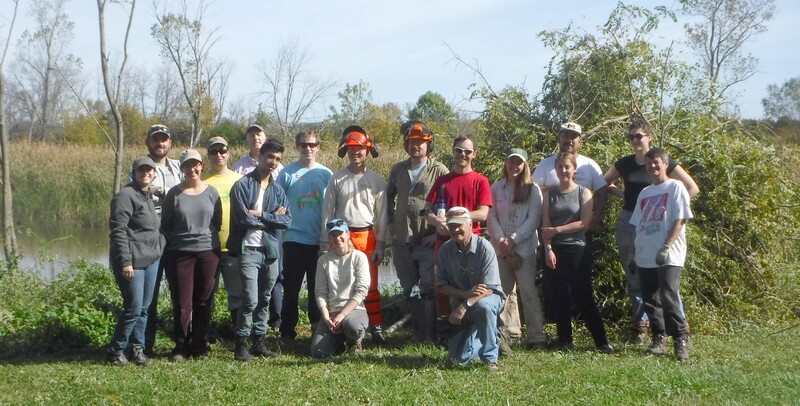 Students at Harper College have volunteer workdays, and when mine return to the classroom after volunteering with POC groups, they always talk about how knowledgeable and interesting the volunteers are—and these are college environmental science students. It’s great that people can get together and share not just their knowledge but their enthusiasm through Plants of Concern. 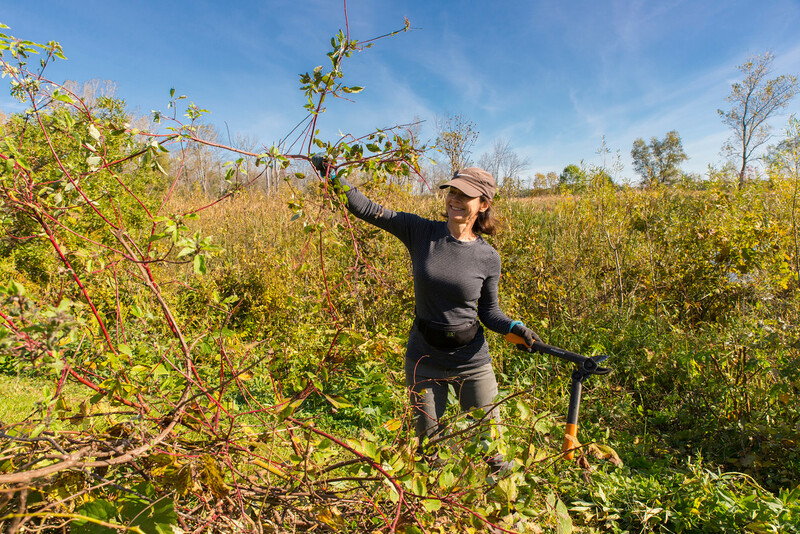 Join the ranks of the dedicated people of Plants of Concern: volunteer today. Plants of Concern is made possible with support from the U.S. Department of Agriculture Forest Service at Midewin National Tallgrass Prairie, Forest Preserves of Cook County, Openlands, Nature Conservancy Volunteer Stewardship Network, National Fish and Wildlife Foundation, and Chicago Park District. Last year, with great anticipation, I became a plant sleuth. Tired of my relative ignorance of plants, I wanted to learn more about them and become more productive while being outdoors, which I am—a lot. So I joined Plants of Concern as a volunteer. Based at the Chicago Botanic Garden, Plants of Concern (POC) was launched in 2001 by the Garden and Audubon–Chicago Region, supported by Chicago Wilderness funding. The program brings together trained volunteers, public and private land managers, and scientists, with the support of federal, state, and local agencies. For more than 15 years, the POC volunteers—a generally mild-mannered but formidable force of citizen scientists—have monitored rare, threatened, and endangered plant populations in our region to assess long-term trends. 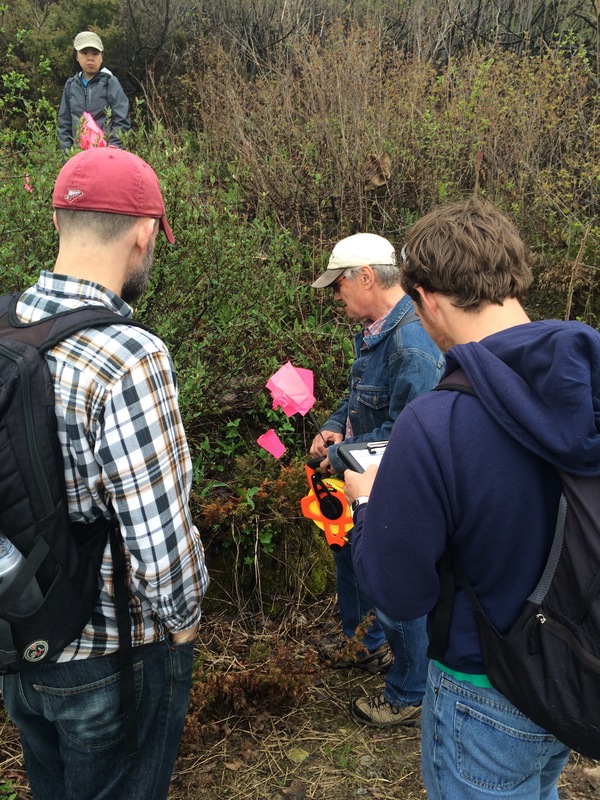 On this foray with Plants of Concern, we flagged and counted targeted plants. Broadly speaking, the data we plant detectives collect provides valuable information. Land managers and owners can use it to thoughtfully and effectively manage land, protecting ecosystems that have helped to support us humans. Scientists and students can use the data to help them understand rare-species ecology, population genetics, and restoration dynamics. The implications are significant, with climate change an important factor to consider in altered or shifting plant populations. I quickly discovered that many POC volunteers are way more plant savvy than I am. Fortunately for me, the organization welcomes people of all knowledge levels. 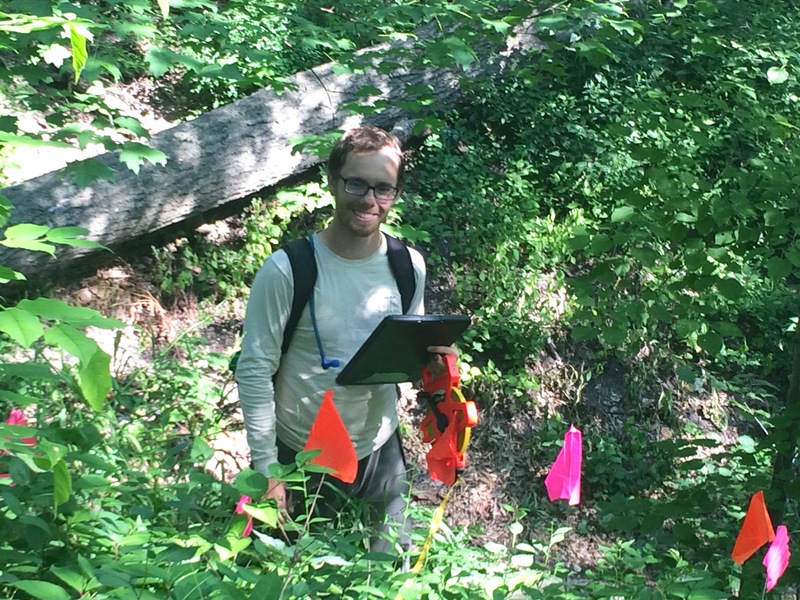 Our goal is to gather information about specific plant populations, ultimately to protect them against the forces of invasive plant species and encroaching urbanization. And our work is paying off. Some POC-monitored plant populations are expanding—reflected in the removal of those species from state lists of threatened and endangered species. Yes, we POC volunteers are a hardy lot. Stinking hot, humid days on the sand dunes near Lake Michigan or the Midewin National Tallgrass Prairie? We drink some water and slap on sunscreen. Steep ravines with loose soil and little to hang onto? Bring it on! An obstacle course of spider webs? No prob—well actually, those are a real drag. Last time I wiped a web from my sweaty face I muttered, “There ought to be a word for the sounds people make when this happens.” (Oh, right, there is: swearing!) But webs slow us down for just a few seconds before we resume the business at hand. Author’s note: Some projects are a little more involved than others. This was one of those. That business is hunting down and noting targeted plants, and continuing to monitor them over time. Our tools are notebooks, cameras, and GPS mapping equipment. In northeast Illinois and northwest Indiana, we volunteers, along with Garden scientists and staff from partner agencies, have monitored 288 species across 1,170 plant populations at more than 300 sites, from moist flatwoods to dry gravel prairies to lakefront beaches and sand savannahs. Collectively, since Plants of Concern began, we have contributed 23,000 hours of our time in both the field and office. From the minute I met up with a POC group during my first foray last October at Illinois Beach State Park, I was hooked. Though I often feel like a dunderhead as I bumble around hunting for my assigned plants, wondering why so many plants look so much like other plants, I love it. One reason is the other, more experienced volunteers and staff leaders, who generously help me as I ask question after question after question. Plants of Concern foray leader Jason Miller: a man of ultimate patience—with me. I decide to interpret my POC foibles as “opportunities for growth,” since slowly but surely, I am starting to catch on. The information sheets distributed as we gather before a foray are making more sense to me. I am getting better at noticing the tiny serrated edges of a leaf, or compound rather than simple umbels, or any number of other subtle ways plants may distinguish themselves from others. That gradual but steady learning curve fits with what Goad describes as “the most critical characteristic we look for in volunteers: someone who really wants to learn.” She adds that diversity among POC volunteers strengthens the program as a whole, helping to build a “constituency for conservation” among people not traditionally associated with environmental activism. Volunteers get a debriefing before heading out on a foray. Newbies go with experienced volunteers. Another challenge for managing the volunteer program, Goad adds, is that “any time you have a whole bunch of different people collecting and sending in data, there has to be a really good process for checking it and cleaning it and making it useful.” Over the years, the program has improved its volunteer training and data processing so that errors are minimized. Goad hopes to expand POC into other parts of Illinois over the next decade. “There are populations across the state that should be visited more regularly,” she says. “We do a lot with the resources we have, but it would be great to expand, and to do so, we need to continue to be creative about funding.” With partners that include forest preserve districts, county conservation districts, many land trusts, and nonprofit agencies that own land—and with its knowledge about challenged plant populations—POC is uniquely positioned to help facilitate collaboration. Whatever the time frame, wherever Plants of Concern volunteers are found, the hunt is on. Some days are glorious for us plant sleuths, such as my first foray last fall. We hiked over the dunes, Lake Michigan sparkling beside us, the cloudless sky brilliant blue. A light breeze kept us cool as we spread out, flagging the targeted plant—the endangered dune willow (Salix syrticola)—which was readily apparent and accessible. Then there are days like one this past June, when the sun beat down over a hazy Lake Michigan, humidity and temperatures soared, and my assignment was a steep, prolonged scramble over ravines to find and flag my elusive target, the common juniper (Juniperus communis). By the end of it I was, to coin a phrase, literally a hot mess—but a happy and triumphant one, for I had indeed been able to plant a few flags. Perhaps it’s time for you to sleuth around and plant a few flags, too! Visit Plants of Concern and find out how to join. On a recent day in Chicago, with the sun beating down and temperatures climbing into the 90s, many college students idling through their last week at home headed for the beach. Lounging about was not on the agenda for the undergraduates gathered at the Chicago Botanic Garden in Glencoe, Illinois, on August 14, however. Instead, they stepped into the cool interior of the Daniel F. and Ada L. Rice Plant Conservation Science Center to present their summer research findings. Thirty college students were at the end of their ten-week Research Experiences for Undergraduates (REU) program, and 22 of them were scheduled to talk about it. Far removed from beach banter, they spoke the language of population genetics, plant diversity, arthropods and fungal pathogens, and the floral preference of bees, among many other topics. Funded primarily through a National Science Foundation (NSF) grant, with additional funding from Northwestern University and others, the REU program is held each summer, and hundreds of hopeful candidates from colleges and universities throughout the United States apply to the program. Based at the Chicago Botanic Garden for the past ten years, the program enables a motivated group of undergraduates to explore a diverse array of topics related to plant biology and conservation. NSF-funded participants receive a stipend of $5,000, plus an additional subsistence and travel allowance. “The REU program was really interesting—I learned so much,” said Jannice Newson, now a sophomore majoring in environmental science at the University of Missouri. 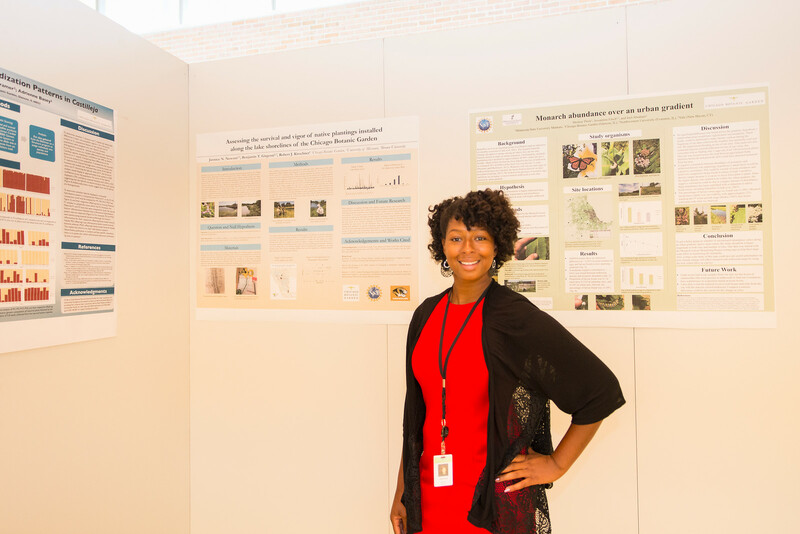 She stood before her poster in the Plant Science Center before presentations began. When prompted, Newson, who evaluated 242 species of shoreline plants over the summer, described a typical day in the program; by the time she patiently finished laying out the daily process, the magnitude of her accomplishment was clear. As hard as the work was, the experience invigorated Newson. “I would love to come back and do more of this work,” she said. “It was such a great group of people!” She previously participated in College First and is an example of how students can move along the Garden’s Science Career Continuum. The continuum allows the Garden to connect its own programs for middle- and high-school students (Science First and College First, respectively) with those offering internships and mentoring for college and graduate students. Jazmine Hernandez, now a sophomore majoring in health sciences at DePaul University, was both a Science First and College First participant. She hopes to go beyond the walls of the Plant Science Center and explain her population genetics research at a conference this fall. Hernandez noted that her REU mentor, Jeremie Fant, Ph.D.—a Garden conservation scientist and manager of both the molecular ecology lab and the REU program—covered much more than research throughout the summer, such as ethics, publishing papers, and preparing a resumé. “It’s just a great experience,” she said. “When I returned to the Garden for the REU program, all I could think was, I am home! 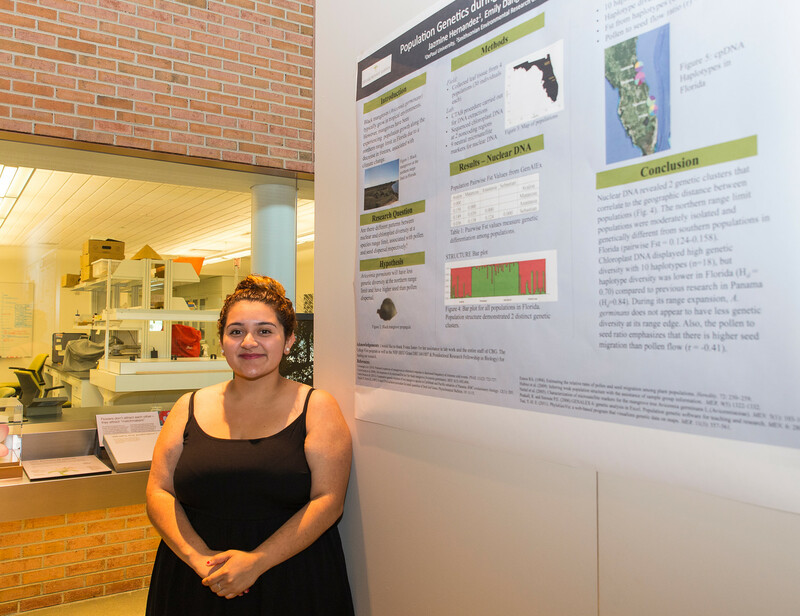 I love it here.” Hernandez, whose poster was titled “Population Genetics during a Manrove Range Expansion,” plans to become a plant pathologist. A team of three Garden experts—Andrew Bunting, assistant director and director of plant collections; Greg Mueller, Ph.D., Negaunee Foundation Vice President of Science; and Eileen Prendergast, director of education—evaluated the posters and selected several for special honors. Taran Lichtenberger’s poster, “Functional trait diversity in prairie plant species,” was deemed Best Poster. Best Presentation went to Lisa Cheung, who elaborated on her poster, “Molecular markers distinguish hybridization patterns in Castilleja.” Evan Levy, whose poster was titled “Floral preference of bees in a Montane Meadow in Flagstaff, Arizona,” won the title of Best Overall. Official honors aside, it was clear through the detailed research posters, the enthusiastic and articulate presenters, and the beaming faces of family, friends, and mentors that every REU participant was a winner. Each year at the Chicago Botanic Garden, fall is heralded by more than brilliant leaf color and crisp temperatures. 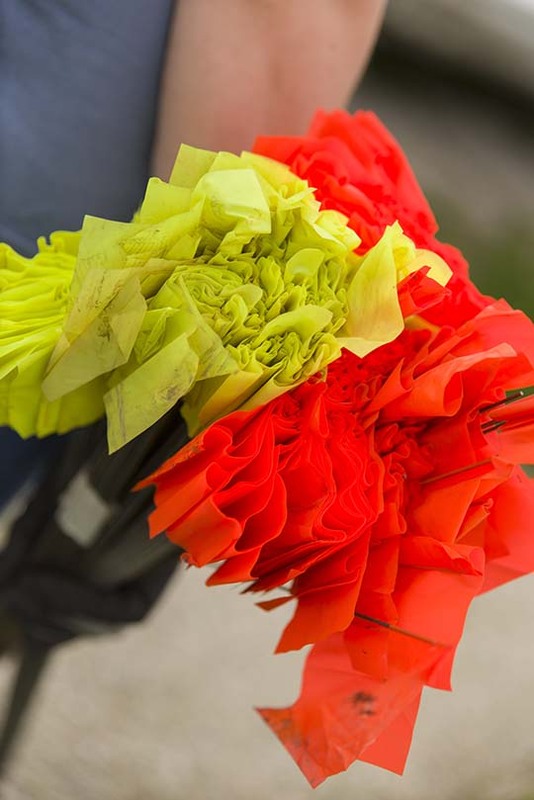 It’s around this time that thousands of visitors flow into the Regenstein Center for the Fine Art of Fiber, visions of gorgeous quilts and exquisite woven and knitted items dancing in their heads. 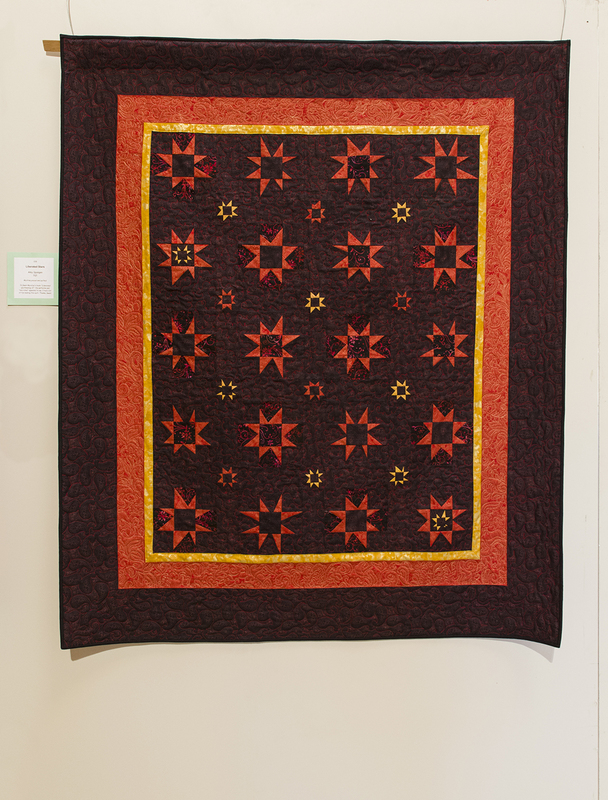 This is the quilt I entered in last year’s Fine Art of Fiber show. 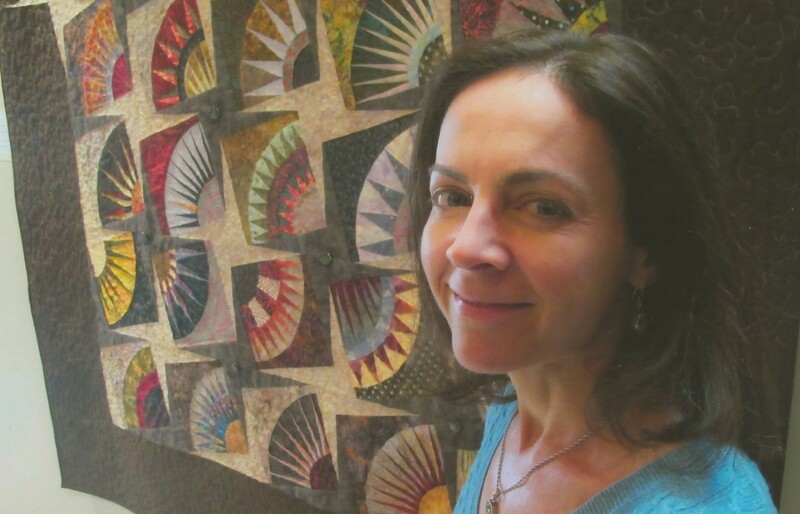 For three days in November, Illinois Quilters, Inc., the North Suburban NeedleArts Guild, and the Weavers Guild of the North Shore offer one of the most anticipated needle art shows in the Midwest. The combined show and sale is an outgrowth of similar events dating back to 1981. I used to be among those who meandered around the show, dazzled by the patterns and colors and textures, wondering what on earth it took to make one of those spectacular pieces on display. Before I began working at the Chicago Botanic Garden, I became a quilter. In the early 1990s, my daughter Hannah (now 24) was toddling around the house, and baby Naomi was more or less velcroed to my body. In the evenings I was going to school, one class at a time, but I needed to do something fun. Something creative. Something inside, given Chicago’s long, long winters and the need to be within hearing distance of my children as I temporarily ignored them. One day, I drove past a quilt shop and saw a sign for quilting classes in its window. Impulsively I pulled over, went inside, and signed up. You know what’s said about addiction, how people who are susceptible become instant slaves to an expensive habit upon exposure? That would be me. Fabric. Give me more fabric! And make it batik! Posing with another Fine Art of Fiber quilt. I gave this one to my friend Jeannie in South Carolina. 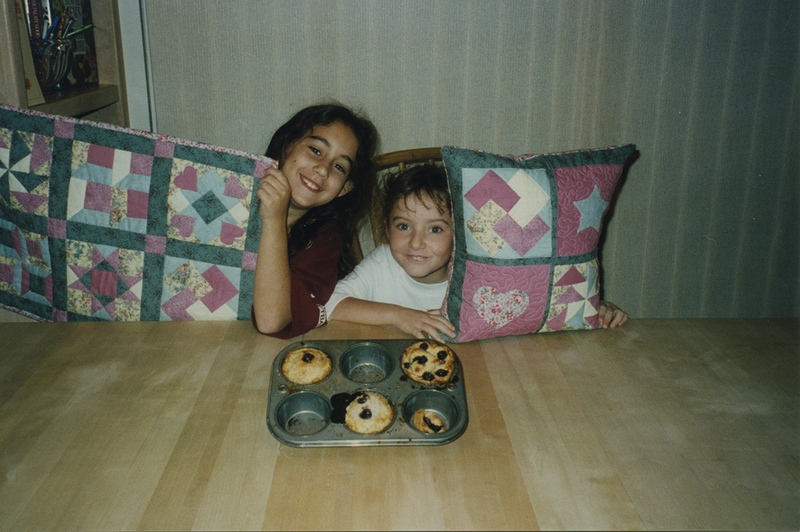 Hannah and Naomi show off a pair of quilted pieces. It’s been fun to see my children grow up in quilt photos. I joined Illinois Quilters, Inc., which is when I found out about the Fine Art of Fiber. Members are encouraged to display pieces in the show. It took years, but finally, in 2001, I felt I was ready for showtime. By then I had another child, Oren (below, wrapped in the quilt I displayed in that show). This year Oren left for college, and I have now replaced his ping-pong area in the basement with a new, expanded quilting studio. Won’t he be surprised! Despite working full time and having what some might consider to be an excessive number of hobbies, I keep quilting. Sometimes I manage only one quilt a year. I am not discouraged at my snail’s pace of production, though: it’s all about enjoying the process. And when I see my quilts displayed alongside the “big boys” at the show, I am thrilled to have made the journey from that first quilting class to the Fine Art of Fiber. Oren, warm and snuggly in the first quilt I displayed at the Fine Art of Fiber. This year’s Fine Art of Fiber is from Friday to Sunday, November 7 to 9, from 10 a.m. to 5 p.m. daily. There is also a public preview night on Thursday from 6:30 to 9 p.m. Click here for more details. I hope to see you there—perhaps you, too, will find inspiration! *Feed dogs are metal ridges inside a sewing machine that help grip and move fabric; they are located beneath a hole in the throat plate, which is under the needle mechanism. Wonder-Under is fusible webbing that bonds two pieces of fabric together. Stacy Stoldt is never not working on an exhibition. 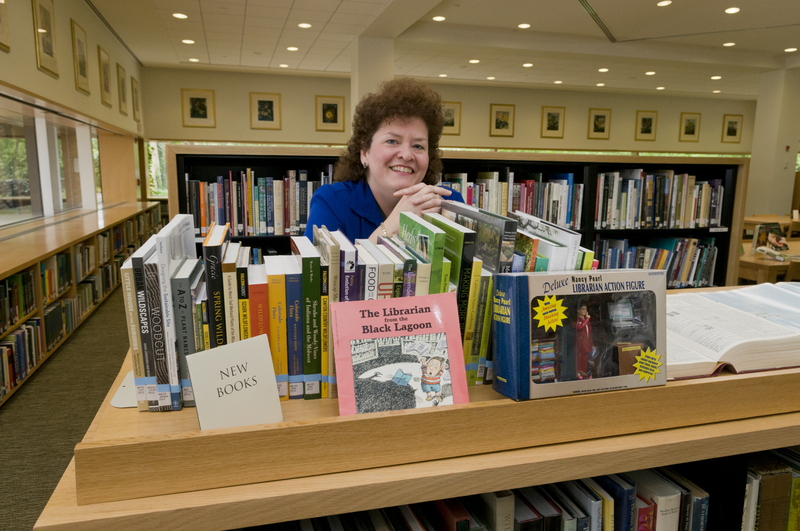 Even when the Lenhardt Library’s public services manager is staffing the desk, answering reference questions, and locating articles for staff, the “million and one” details involved in putting together the library’s four annual rare book exhibitions are percolating in her brain. Stacy Stoldt awaits patrons in the Lenhardt Libary. Stoldt loves her work, and one of her chief pleasures is deciding which literary treasures will be selected. It is a process involving research, more research, and finally, she says, just a bit more research. The excitement of finding the perfect volume has prompted Stoldt to burst into song (just ask cataloger Ann Anderson, a neighbor in the basement office who sometimes joins in). The public services manager and her colleagues have many volumes from which to choose: in 2002, the Lenhardt Library acquired a magnificent collection of 2,000 rare books and 2,000 historic journals from the Massachusetts Horticultural Society of Boston. 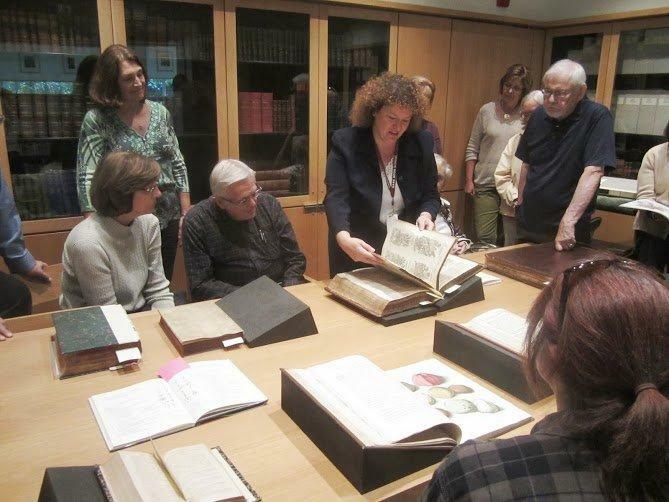 Stoldt shows rare books to a group in the rare book reading room. Before Stoldt begins hunting down books, there are meetings to decide Lenhardt Library exhibition topics for the year. That process begins with a brainstorming session including Stoldt, Lenhardt Library Director Leora Siegel, and Rare Books Curator Ed Valauskas. Sometimes the trio bases their topics on themes within the collection, such as the upcoming succulent show that features the work of A.P. de Candolle and botanical-rock-star-illustrator Pierre-Joseph Redouté. 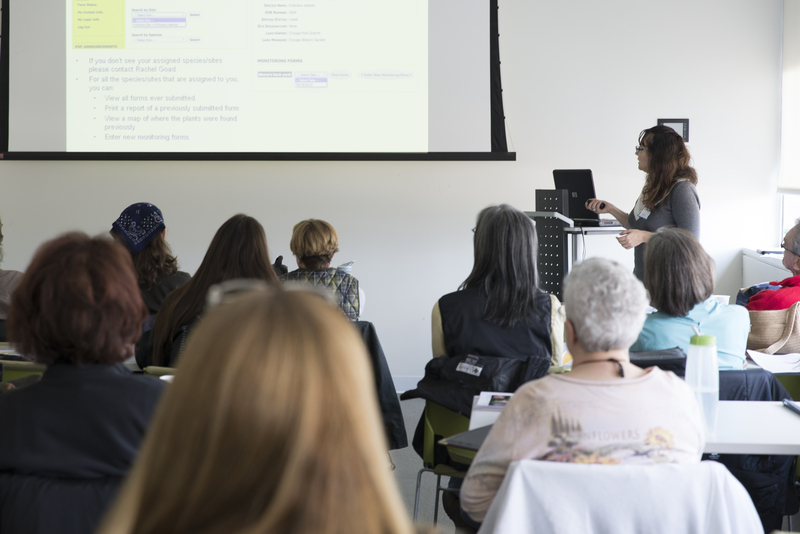 Alternatively, they might collaborate with another botanical library on a theme, as happened when the Lenhardt Library team worked with the New York Botanical Garden’s LuEsther T. Mertz Library on the recent exhibition Healing Plants: Illustrated Herbals. Other times, they select topics that complement events held at the Garden, such as Butterflies in Print: Lepidoptera Defined, which ran in conjunction with last summer’s Butterflies & Blooms. 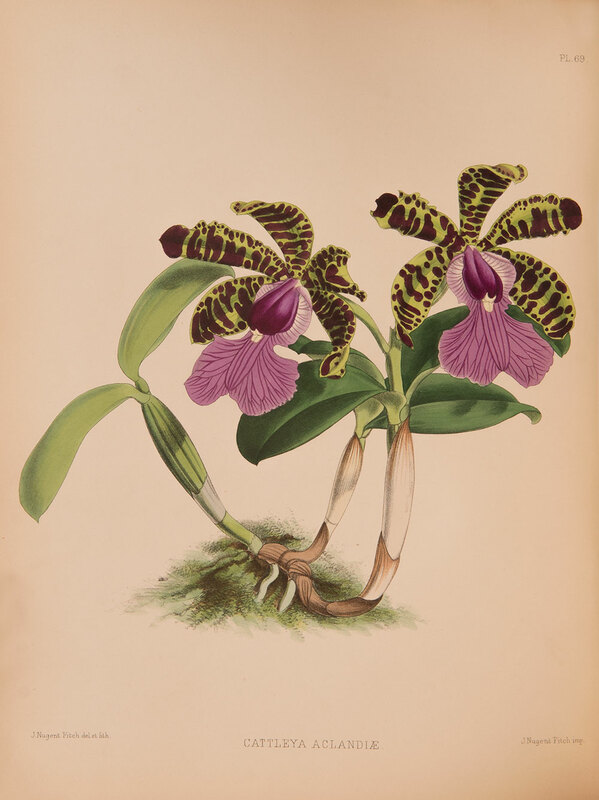 The Lenhardt Library’s newest exhibition, Exotic Orchids: Orchestrated in Print, runs through Sunday, May 11. 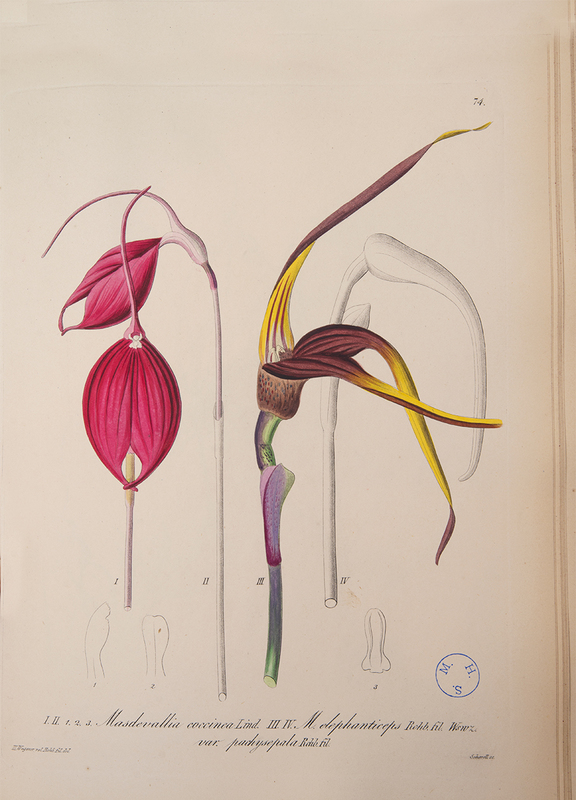 This image is from Xenia Orchidaceae: Beiträge zur Kenntniss der Orchideen, by Heinrich Gustave Reichenbach. For some exhibitions, Stoldt does it all—A to Z. For others, she receives the researched text, citations, and selected illustrations from Valauskas or Siegel and develops the material into an exhibition. Once the topics are established, research is completed, and explanatory text is written and edited, graphic designers enter the picture. Stoldt selects images from the featured books to use with the accompanying text, and then the designers work their magic. Along the way, Stoldt and Siegel review the progress. The result is an exhibition compelling not only for its content but for its elegant layout, which extends throughout the display cases that greet visitors as they enter the library. Accompanying library talks are on Tuesday, February 18, and Sunday, March 9, at 2 p.m.
“For our new Exotic Orchids exhibition, we really wanted to show some bling!” said Stoldt. Within the Rare Book Collection, there was so much to choose from on orchids that she found the selection process daunting. Visitors to the exhibition will find the beauty and science of orchids well-represented, and discover items about orchid conservation and preservation as well. 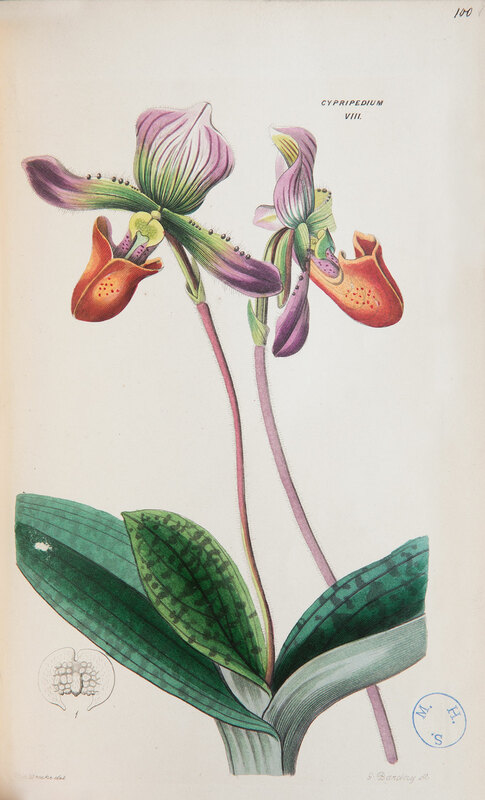 Stoldt noted that conserving the books and the artwork that document a plant’s existence is almost as important as preserving the actual plant. In cases two and three of Exotic Orchids, there are select illustrations from two orchid collections, Les Orchidées (1890) and Les Orchidées et les Plantes de Serre (1900–10), which the Lenhardt Library recently had conserved by the Northeast Document Conservation Center (NEDCC) through grant funding from the National Endowment for the Humanities (NEH). How did the conservation process work? Professionally trained book and paper conservators removed the illustrations from their original acidic bindings; then the inks were tested, the surfaces were cleaned, and the illustrations were digitally photographed. Then the illustrations were placed in chemically stable folders and housed in custom-made boxes made from lignin-free archival boards. Conservation completed! Stoldt recently brought out some rare volumes to demonstrate the variety within the Rare Book Collection. As noted on its web page, the collection reflects a relationship between people and the plant kingdom that has been documented since the earliest days of print, when botanists were not simply plant describers, but explorers. Out came volume after volume, with Stoldt pointing out noteworthy details about each. Among them was the oldest book in the collection, Historia Plantarum, written by Theophrastus (d. 287 B.C.E.) and published in 1483 (it has some unusual marginalia). There was also an exquisite Japanese book on flower arranging, Nageire Kadensho: Saishokuzu Iri, published in 1684 and donated by longtime library volunteer Adele Klein. Stoldt continued her informal presentation with seemingly boundless enthusiasm, finishing with lush life-size images from The Orchid Album, published between 1882 and 1897. More than once, Stoldt returned a book to the vault at the end of the show-and-tell only to call, “but wait! There’s more!” as she glimpsed another book she absolutely had to show. This librarian really, really loves her books. And she feels very protective of them. Devoted patrons feel that the library and its exhibitions enhance their lives; in turn, some are moved to enhance the Rare Book Collection. “We have our patrons, and then we have our patron saints,” said Stoldt. One patron who came to the 2009 exhibit on Kew Garden’s 250th anniversary enjoyed the accompanying talk by Ed Valauskas so much that she donated the 1777 edition of Cook’s Voyage, or A Voyage Towards the South Pole, by Captain James Cook, which had been in her family for family for decades. And longtime members John and Mary Helen Slater made it possible for the library to acquire 11 volumes of Warner’s Orchid Album. Don’t be surprised if you come to see one specific book in the collection and end up seeing many more. It will be a visit you won’t forget! Rare book viewings are by appointment only during the hours of 10:30 a.m. until 3 p.m. Monday through Friday, subject to availability. For an appointment, call (847) 835-8201. Click here to purchase tickets to the Orchid Show online.